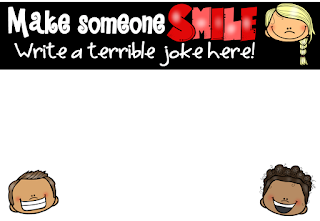 Here's a little freebie to brighten up your staff room or classroom! Print it, laminate it and then you can write jokes with a whiteboard marker. Simply wipe it clean when you're ready for another terrible joke! Here's hoping it brings your staff/students lots of eye-rolling and hidden smiles!